Announcing that I bought a car on my budget living blog is kind of ironic, I know. But what if I told you I planned for this purchase, budgeted my dollars, and found a great deal? For someone who previously only bought cars from family members, I'm pretty proud of myself. Here's how it happened. For the next decade, we drove the hell out of that car. After 180K miles, multiple trips all over the country, two giant dogs that love to go for rides, and some strange sounds coming from the engine, it was clear that we were running on borrowed time. To prepare for its inevitable demise, I started a "New Car" category in YNAB about a year ago, diligently saving as much as we could. 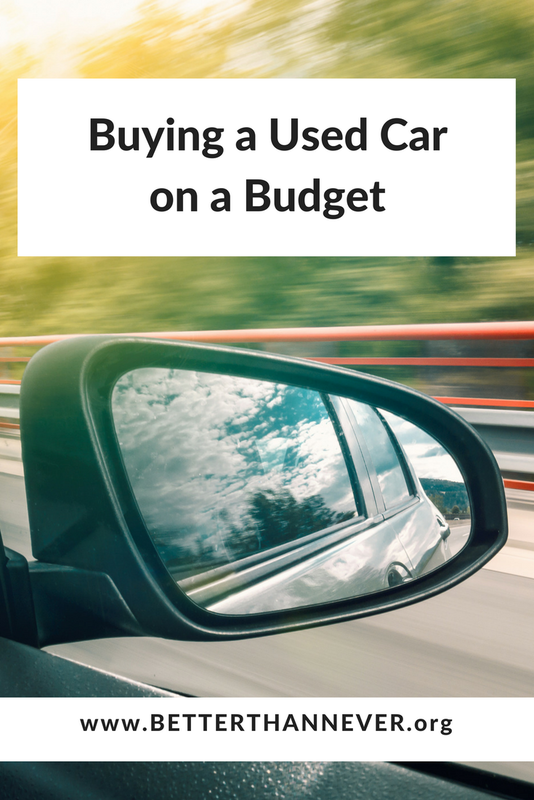 We were making great progress and my dreams of buying a used car in cash seemed within reach. Then we started living on one income, and progress slowed significantly. The Escape, along with our savings account, limped along. And then our yearly inspection was due. To no one's surprise, the Escape failed spectacularly. I won't get into the nitty-gritty because this isn't an episode of Car Talk, but suffice to say we were looking at $1500 of repairs just to make it road-worthy. Instead, we decided to go ahead and buy the new car we'd been saving up for. While we didn't have quite enough to buy one outright, we did have a hefty down payment, along with whatever we could get for a trade in. Financing, we hoped, would be minimal. A used car from a dealer. As fuel efficient as possible. Something we could drive for the next ten years. As you can see, we weren't that picky - we were open to pretty much anything that checked these boxes. We bank with USAA, and they have a great car buying tool that allows you to set parameters and search dealerships in your area. The same day the Escape failed inspection, I started searching to see what was available. 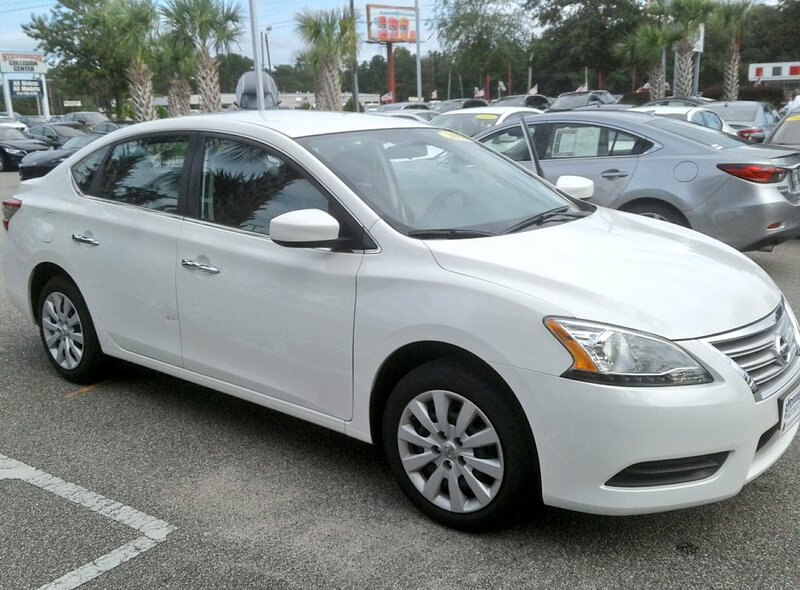 Two cars in particular quickly rose to the top of my list - a 2016 Hyundai Elantra, and a 2014 Nissan Sentra. The Elantra was newer, a little fancier, yet $1500 cheaper. It had 50K miles, but didn't come with any kind of warranty, which made me nervous. The Sentra was in great shape, had only 25K miles, and came with a lifetime Powertrain warranty from the dealer, which ultimately sealed the deal. As our salesperson explained, most people only keep their cars for a few years, trading them in for something newer and shinier. Since we were planning to drive our car for the next decade, we would definitely take advantage of the warranty at some point. In other words: sold. Our car payment is $136 a month, which means we will pay it off in three years. Except that's a pretty low payment for us, so we're aiming to pay it off in half that time. Obviously, I'll keep y'all updated. The only negative (pun obviously intended) is seeing our bank account take a hit. Not only did we spent a large chunk of our savings, we also took on a not-tiny amount of debt. Thanks to YNAB's handy line graph of our net worth, the downward plunge is glaringly obvious. On the bright side, it's great motivation for paying it off as fast as possible. What kind of car do you drive? Or are you one of those lucky people who are car-free? We used to be a one-vehicle family, but Wilmington is just big enough and our public transportation is just terrible enough that it's hard to get by with one car.